Being an entrepreneur isn’t for everybody. However, for a motivated self-starter with big ideas, it could be the gateway to a bright future. Getting there is a process, however. You must have a good understanding of what you’re good at, and it needs to be a viable service or product that solves a problem for an identifiable audience. The good news is, you don’t have to have a business degree to be successful as an entrepreneur. But you will need a strong backbone and be willing to take a few risks. – What subject do I know a lot about? – What are my strongest skills? – In a perfect world, what kind of work would I be doing? – If you were to write a book, what would it be about? – Have you got any hobbies that would translate into a business? If the answers to any of these questions overlap at all, you just might be on to something. If you are widely considered to be an authority on wine, for instance, perhaps you should be in the business of wine consultation, becoming an online wine merchant, or developing an app that will solve the problems of wine drinkers everywhere. Explore the viability of your concept by seeing who your competition would be and what it would take to get to their level or surpass it. – Services: do you design wine lists or recommend wine for collectors? Do you want to offer secure climate-controlled storage for their collections? Can you broker purchases of rare wines from agencies not generally open to the public? Can you take people on tours to wine country? – Physical products: are you passionate about wine discovery? Can you envision yourself running a boutique wine shop in your community? – Digital products: are you a wine educator, or do you have any interest in bringing wine education to the public? You might consider doing webinars or teaching wine appreciation courses online, or you might have an idea for an educational mobile app or one that helps people organize and value their wine collections. – Expert advice: If you have a lot to say and share about your topic, you could position yourself as an authority by writing or blogging about it, or establishing a website devoted to giving advice on the subject. Once you have decided on your direction, you’ll need to establish who your competitors are. Identify the top contenders and see if what you plan to do overlaps in any way. Follow them on social media, and have a good look at their demographic to discover everything you can about what they are doing right and where they are falling short. The best entrepreneurial undertakings have something that is unique, something that solves a common problem. Ask yourself what value you are bringing to the space you are entering, and whether you would be a customer if the shoe were on the other foot. If the answer is a resounding “YES!” then you might just have a winner. If you are an entrepreneur or small business owner, we would love to meet you. Our flexible workspaces provide everything you need to be successful in today’s competitive marketplace. Call today, or schedule a tour. Most home workers can write off some of their housing costs on their taxes, as a portion of your home is dedicated to working. It offers a better work-life balance, affording you more time at home with the family. It opens up the possibilities of working with companies and individuals in other cities, states, or even countries. And there’s more, but you get the picture. If it were ten or more years ago, this wouldn’t have been possible without a lot of effort. Access to better technology and the changing landscape of global enterprise has cracked the playing field wide open, helping us in equal measures to save our sanity and save the planet while we’re at it. You are using your home address for your business, meaning it is published and anybody can just ‘drop by’. You likely have no dedicated meeting space in case you have to meet with a client or a supplier. This means you’re relegated to meeting them at a local coffee shop or another public place. You can’t grow your business; if you need to hire more people, where are you going to put them? 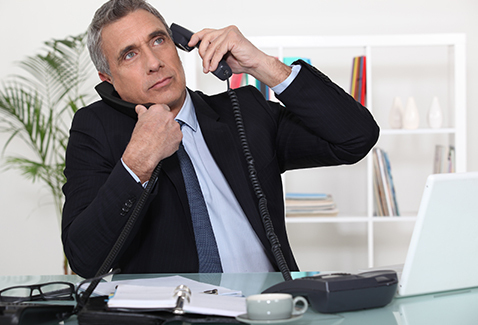 You will be using your personal, mobile, or home phone for business calls, which can be an issue if you share a line with your kids or somebody else in the house. A virtual office can effectively solve all of these issues, and help you present a more professional image to the people you are trying to impress. A virtual office is just about exactly what it sounds. It is a physical place, a dedicated office building with real people staffing it that can handle a short list of your most basic business tasks, including giving you a business address, handling your business mail, taking and forwarding your business phone calls, and more. 1. Present a professional image: with a dedicated business address, you will look like the serious business you are, and not just “a person working from home”. While most of your clients might not care, it may limit who you do business with if you don’t have a solid business home base. 2. Admin assistance on-demand: Have your business line answered by a real person, who can either screen your calls or forward them to you wherever you are. Accept and send mail at/from the business address, and have a virtual assistant to take care of sundry tasks when you’re busy. 3. Meeting and conference space on-demand: If you ever need to meet with a client or supplier, your virtual office can accommodate your needs with meeting room rental by the hour, by the day, or by the week. 4. Have the ability to scale as needed: if your workforce suddenly grows, a virtual office gives you flexible options, with office space on demand, coworking space, and so much more. 5. Reduce overhead: No matter if you are just one person or a team, a virtual office helps you save money on office overhead by offering many of the great benefits of a corporate office without the lease, furniture, and equipment expense. If you are an entrepreneur, freelancer, or small business owner, you know how important it is to stay lean. A virtual office allows you to grow your business without all the expense of a conventional office space, supporting your professional development with professional office services that you can afford. If you live and work in the Weston, FL, area, drop by Lakeside Executive Suites for a tour today. We’d love to tell you more about our virtual office services, and how they can help you increase productivity and support your professional image. Meetings are a necessary part of doing business, and essential to a team environment where there is input required from all of your colleagues. But if the mere mention of a meeting has your workforce running for the hills, maybe it’s time to rethink your meeting strategy. Meetings should be productive, they should encourage new ideas through discussion, and help co-workers understand what others are concerned about. However, if half of the room tunes out before it’s even begun, your meeting productivity is already out the window. Meeting management rule #1: Be realistic. Don’t try to cover a hundred things in one hour. Having this kind of expectation always leads to the feeling that you didn’t get anything done at all. Look at the key points you need to address, and focus on that. Meeting management rule #2: Make an agenda in advance. Second to being realistic, having a clear agenda before you walk in is probably job one. take some time to consider everything that needs to be discussed, and prepare a list of topics to be covered, with bullets under each item to stimulate discussion. This will also help you remember to cover everything that needs to be addressed. Then, make a copy of this agenda for every attendee and have them ready at each chair when they arrive. Meeting management rule #3: Make sure your technology works BEFORE you start the meeting. Meeting management rule #4: Everybody should have something to bring to the table. Make it imperative that each person is responsible for one thing in the meeting. If it’s a general meeting, then assign each individual to bring an issue into the meeting they would like to discuss. This will keep them on point through the proceedings and help them feel like they are actually contributing. Meeting management rule #5: Only invite people who need to be there. If you’re talking about finance, you don’t need sales and marketing personnel in your meeting. If it’s about human resources, you don’t need sales. Make sure the right people are at the meeting. If you only invite essential people, it will be easier to stay on track. Meeting management rule #6: Don’t stray off topic. Sometimes it’s inevitable that the discussion goes off in another direction, but if you see it veering too far afield, even if it’s interesting and valid in a broader sense, rein it in and table it for another time. You only have so much time. If you are a small business, entrepreneur, solopreneur or startup company in Weston, FL, and you are looking for a place to call home, give us a call today. We help small businesses thrive with flexible options such as shared office space, virtual office services, meeting room rentals, and a collaborative coworking environment that is guaranteed to drive innovation. Come by for a tour, or drop us a line.